I’ve looked for the best folding saws for a long term survival pack and this is what I’ve come up with. I gotta say that I would prioritize an axe over a saw. But if you need to cut large diameter trees, or cut logs into short sections for use in a wood stove, then you need a saw. Obviously having both would be best, but it’s more weight on your back. A folding saw for survival must be durable, portable, reliable, and efficient. The idea being that you can carry it in your backpack and use it for an extended period of time for shelter building and cutting firewood. 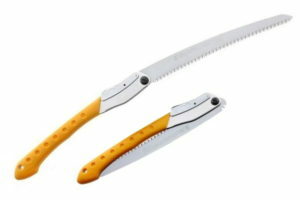 There are two main folding saw styles: bow saw and folding saw. Collapsible bow saws are more familiar and easier to use for must people. Their blades are thinner which makes them easier to break. Although, they are lighter, so you can carry extra blades. Their frames have more moving parts so those are also potential weak points. 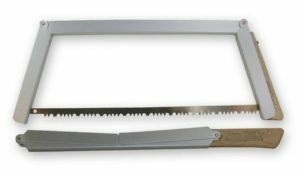 Folding saws are faster to assemble, and more portable than bow saws; It’s way easier to hike around with a folding saw. Although this might not be important if you’ll be using the saw only at camp. Their blades are more sturdy, heavier, and can be replaced as well. Their construction is simpler and there are no parts to lose. There is another option for a long term survival kit, carrying only a saw blade. This option makes sense if you will be carrying an axe already, or if you really want to reduce the weight of your pack. The blade would weight 60-100g or 2-4 oz with something to cover it, that’s like 1/5th of the weight of a saw. The disadvantages I see with just carrying a blade is that the saw will not be as efficient and easy to use as a factory made saw. An improvised saw will be heavier and bigger once assembled. The advantages is that you could bring two or more blades and have more than one saw. All these saws are great so it’s hard to choose one. If I planned on building a log cabin-like shelter that required lots of wide logs, I would choose either a Boreal 21, Silky Bigboy or a Katanaboy. Calories are everything in survival and having the easier, most efficient means of cutting trees makes sense. If you think you’ll need to cut lots of logs to feed a woodstove/fireplace to heat your shelter throughout the winter, those saw are your best bet. 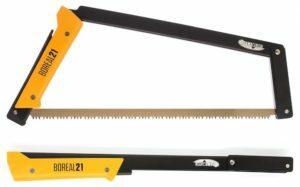 The Boreal 21 is a great design, its grip is better than the Bob Dustrude saw and the form aims force more in a downward direction. It does have a shorter blade and is heavier. Changing the blade is also much easier to do with the Boreal 21 vs the Bob Dustrude. Bow saws are awkward to use when sawing from the side, upside down or other different positions. I’d say that if weight and length is not a problem, the Katanaboy 500 would be the best, most efficient saw to choose. 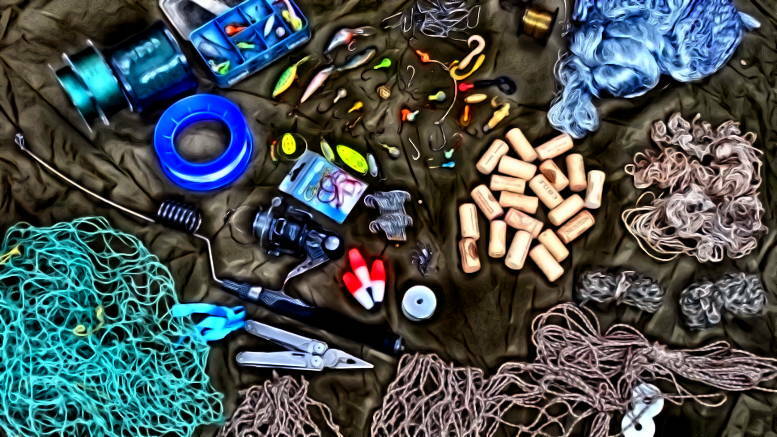 If weight is a constraint either the Boreal 21 or the Silky Bigboy would be good options. The Boreal 21 seems to be more comfortable to use over long periods of time because it has a pistol handle. The replacement blades cost 1/3 of a replacement blade for the Silky. The Silky Bigboy is more compact, versatile and easy to carry around while walking. Ultimately, it comes to personal preference, and how you plan to use the saw. I would probably choose to pack the Boreal 21 for long term survival just because it is portable and seems it would be easier to use for extended periods of time if I’m weak or exhausted. 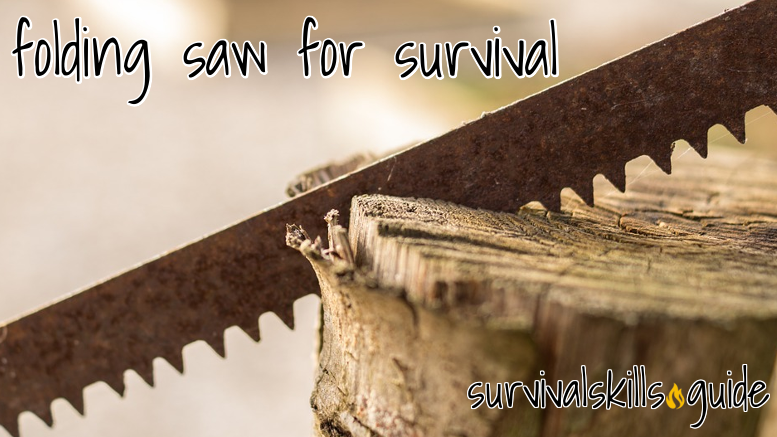 Be the first to comment on "Folding Saws for Long Term Survival"